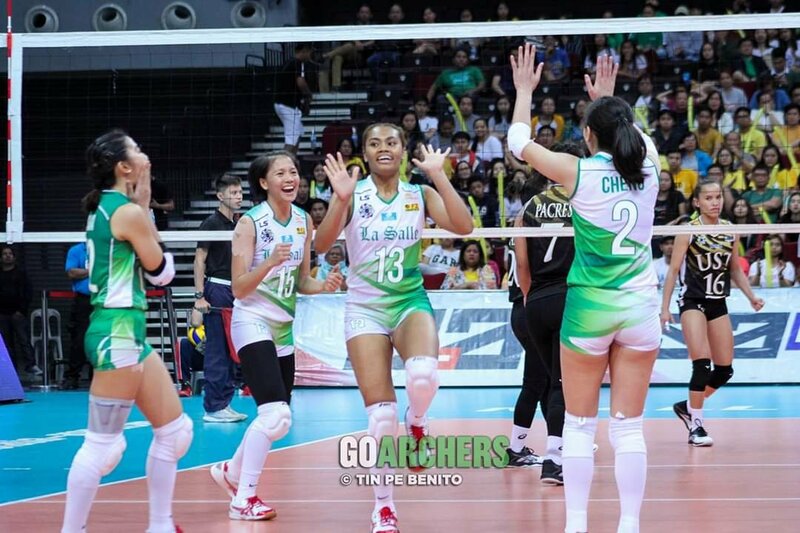 The Lady Spikers are very much in control of their destiny at this point. The team has 4 games left in the elimination round. Two of those opponents are at the bottom of the standings (Adamson and UE) while the other two, though formidable, are teams that they have beaten convincingly in the first round (Ateneo and FEU). La Salle is currently in second with a 7-3 slate. It’s unlikely that they can still claim the top spot over the Lady Eagles (9-1). But that’s okay. What is important is to secure the twice to beat edge in the Final 4. With Ateneo beating UST, UP and FEU for us (Please! ), those three teams are all tied now at 6-4. The good news is that they all three have yet to face each other in the second round which means one of them will fall to at least 6 defeats. You think La Salle will drop 3 of their last 4 games? Nahhh! Final Four stint is assured. Worst case scenario, La Salle will finish the elims at 10-4, good for a playoff for the second seed. But of course it’s better that they just win the rest of their matches which they are very capable of doing. So let’s forget being number one at the end of the elims. Championships are not won there. Once the playoffs kick-in, records no longer matter. The Lady Spikers shall play Adamson tomorrow.